Hillary Chybinski: a system that works. . .
a system that works. 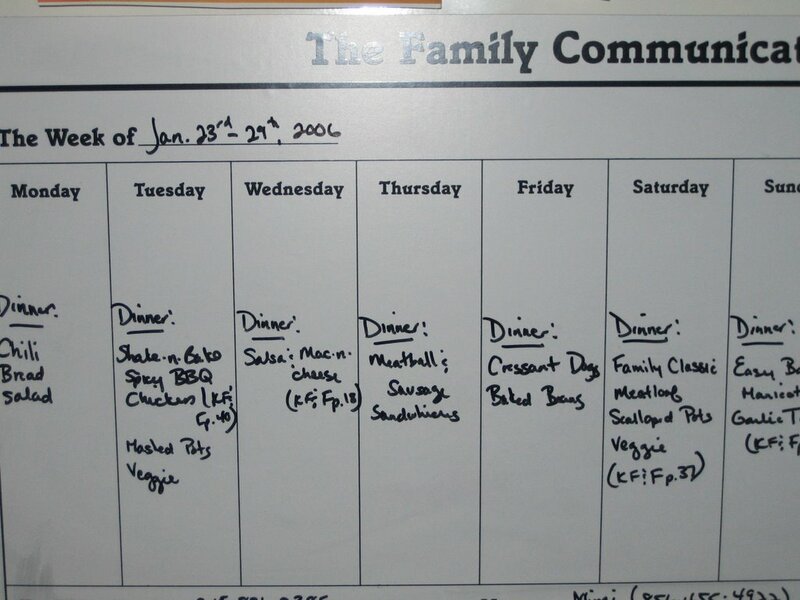 . .
. . .so i had some people on over on saturday, and they were remarking over my meal planner. i explained that this is the only sytem that works for our family. on sunday, i sit down and plan out a week's menu and make the grocery list. the grocery list is a word document that i print out and highlight wants/needs. on the back, i jot down the menu, so i have it at the store. 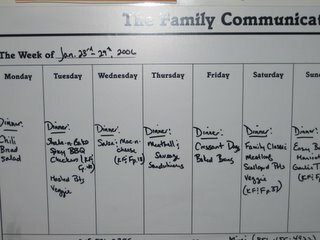 when i get home with the groceries, i transfer the menu to the white board on the freezer door. i include the book and page number if i'm using a recipe from somewhere. i also include any activities going on for the week. that's it - no questions - the information is there. it eliminates the 45 minutes of discussion over what should we have, then the eventual decision to order out. i have to admit - it not a favorite chore - but it does work for our family. it reduces our eating out costs, we don't waste as many groceries, and i think it makes ryan a better eater.